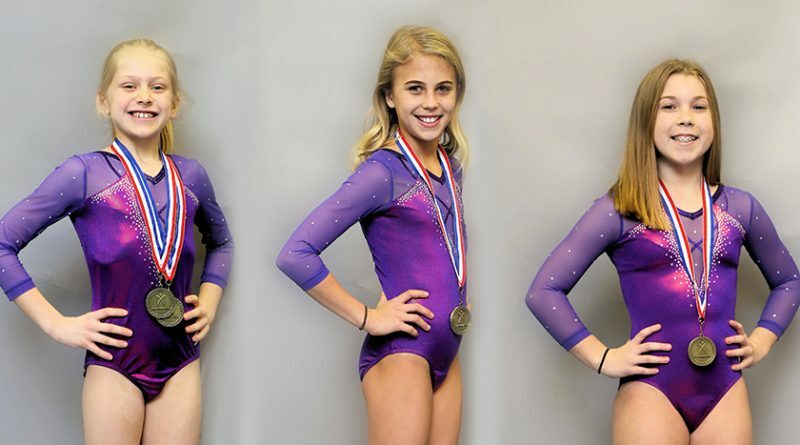 Three competitors from Russell Gymnastics have placed first in their categories during a Waukesha competition in December. A total of 33 level 3-5 compulsory gymnasts from Russell Gymnastics qualified to compete in the USAG state meet in Waukesha. Kaylee Dalsbo, a level 5 (division 10) gymnast, scored 9.050 in the vault, while Sophie Hasenohrl, also a level 5 (division 12) gymnast, scored 9.375 in the vault. Elise Lobner, a level 3 (division 9) gymnast scored first-place finishes in both categories of beam, with a score of 9.375, and all-around, with a score of 36.825. Russell Gymnastics opened in 2012 and offers a full range of recreational and competitive gymnastics programs, from parent-tot classes through optional level 10. Classes for boys are also offered. Russell recently moved to their newly-constructed gym located at 5717 E M Copps Dr. For more information go to russellgymnastics.com.